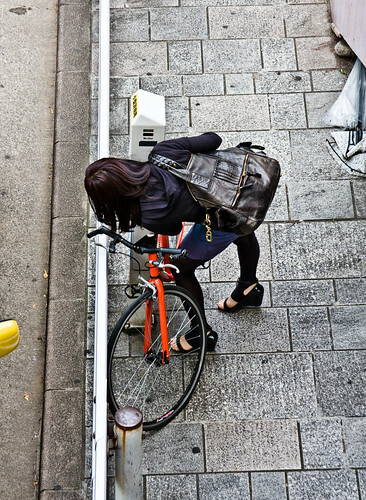 The simple, graceful act of unlocking a bicycle. As seen in Omotesando, Tokyo. Simplicity in Omotesando. And on a fine, MUJI bicycle. With the spectacular Prada flagship building in the background. Not just removing a lock. Stealing a computer! with all due respect to your previous post & I could be wrong about this, but judging from your lovely Copenhagen pictures, it looks a lot cleaner there than it is here in New York. Maybe if more people rode their bikes to work, there would be less dirt to contend with, but it is a real issue for people who need to arrive at work somewhat pressed & presentable. Hopefully until the majority is using bikes, those who can without this concern will do so. Love your Cycle chic by the way.